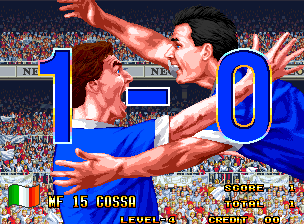 It's Brazil vs Croatia that gets us under way tonight and that has really got us in the mood to start thinking about our favourite Football Arcade Games of all time. A trip to the Amusement Arcade would always mean trying to hunt down the best footy game that the establishment had to offer and over the years there have been stacks of attempts to create the perfect arcade game experience. It's got to be said, many didn't come close to getting it right BUT still we played the living daylights out of them as they swallowed our hard earned pound coins…. So what are The Games Freezer Top 5 Football Arcade Games Then? What Arcade Football delights to we have here for you lot then? A fast and furious footy game whereby you control the action using a trackball. It's a great game to play in two player mode as you literally go head to head with your opposition as you face each other whilst playing. A really unique football game that we're surprised hasn't been repeated since! After watching someone in the local fish and chip shop complete this game we were hooked. The end sequence is brilliant and I wanted to see it again! The obsession with this game lasted for years but we never managed to complete this relatively short game. 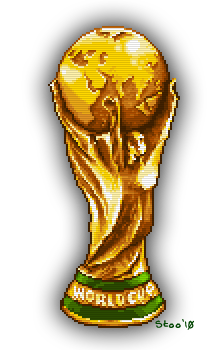 The gameplay wasn't great but the game was truly addictive and just around the time of World Cup 90 when we just couldn't get enough of footy video games! At the time, this game was like nothing we'd seen before in the arcades. You had 8 teams to choose from and once you'd chosen your team you then get to choose your star player. The star player had a super powered shot that would activate in the last moments of the game and basically knock over anyone who got in the way!!! Great Fun, especially on the sit down arcade machine for some reason! 2. 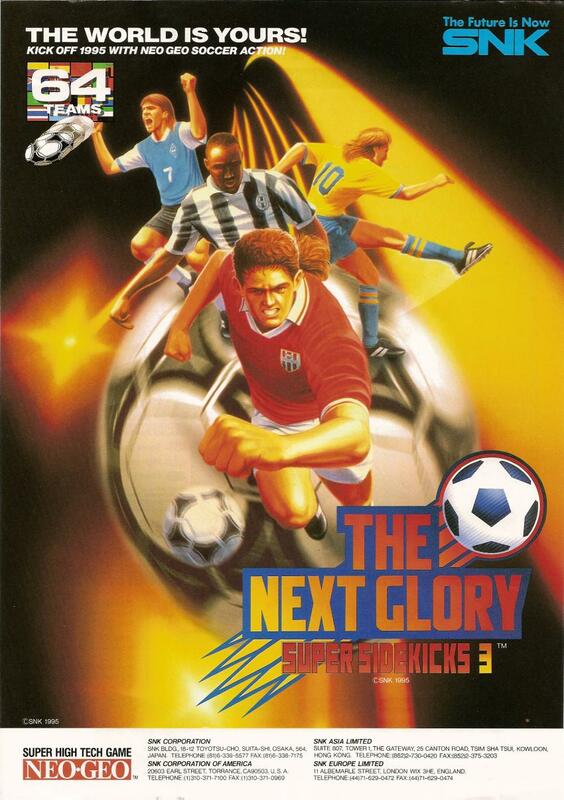 Super Sidekicks 3 : "The Next Glory"
The third Super Sidekicks is in our opinion the best. Firstly it's fun to play with loads of cool in game cut screens and animations that really add character to the game. This version features 64 teams to select and a really cool tournament option. Loads of fun in the arcade and also on your NEO GEO! 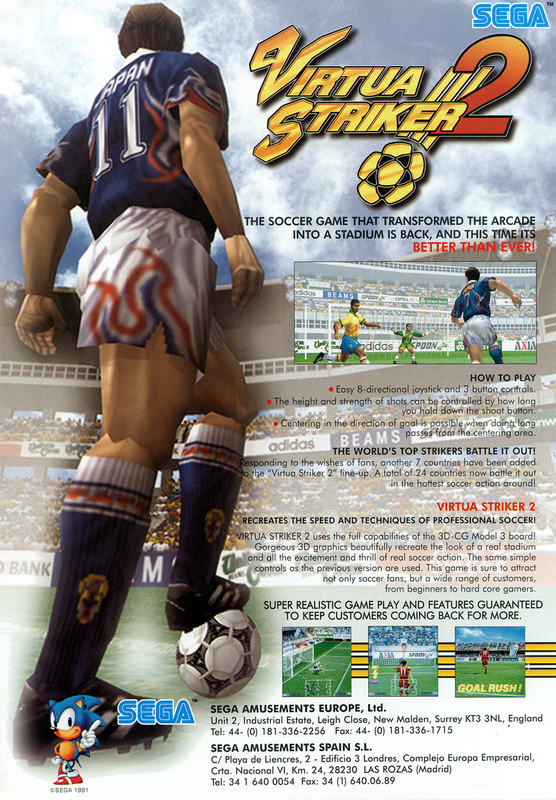 So here we are, it's got to be Virtua Striker 2 for us. A game that at the time was visually second to none and has got a lovely flow to the football. A guaranteed pound guzzler whenever we spot this in the Arcade. If you've never played this beauty, make it a priority today, as its the stuff of Arcade legend. What's YOUR Favourite Arcade Footy Game Of all Time?